Join us for a spooky afternoon on the unholy day of October the 13th! 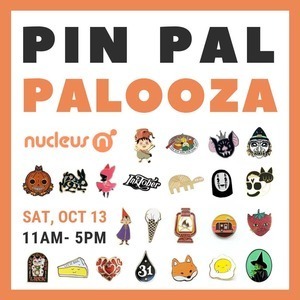 Gallery Nucleus is holding our fourth Pin-Pal-Palooza, a humble convention for all things enamel/lapel pin-related designed by your favorite artists and more! We've invited many vendors and spirits from L.A. and the beyond! Their shops will materialize in our space on Saturday October 13th, 2018. An October event is not complete without some Halloween flair. Join us in your favorite costume! You'll find some vendors may have some trinkets that will awaken the spirits! First 100 people in line will receive a free gift pin. Limited to 1 pin per person. Raffle Giveaway. Winner announced each hour starting at 1:00 pm. Grand prize of all 8 Nucleus-exclusive pins at 5:00 pm. Select artists will debut new pins at the event; stay tuned to our social media for release announcements! Trading Post - leave a pin, take a pin. Trading chances are limited to 2 per person. Enamel only please!